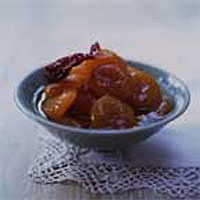 Dried apricots pickled in a fragrant, spicy, sweet-sour syrup are perfect with cold chicken, a slice of honey-roast ham or a crisp-crusted pork pie. Good vinegar is important in a pickle - here it sharpens without swamping the delicate flavour of the fruit. This recipe also works well with prunes or any dried fruit left over from Christmas. Ready-to-eat apricots do not need pre-cooking. If you are not using ready-to-eat fruit, put them in a heavy pan, with just enough water to cover. Bring to the boil, turn down the heat and simmer for 20 minutes, until the fruit is plump and tender. Drain. Heat the vinegar with the sugar in a heavy pan, stirring until the sugar is completely dissolved. Put the apricots into the vinegar syrup, add the dried chillies and ginger, bring back to the boil, turn down the heat and simmer for 10-15 minutes, or until the vinegar syrup has thickened a little. Ladle into sterilised jars (straight from the dishwasher, or heated in a low oven for 20 minutes) with enough of the fragrant, syrupy pickling liquid to cover. Allow to cool, seal tightly and leave on the shelf for a couple of weeks to mature.